To mark Trustee's Week, we're celebrating the wonderful support we receive from our board of incredibly dedicated, skilled and passionate trustees. We recently spoke to Chris Rollings, to find out more about his role as Vice-Chair, and the other ways he gets involved with the work of Missing People. I am currently the Vice-Chair of Trustees at Missing People; a role I have held for a number of years. It’s a responsible role but one I thoroughly enjoy, and it's certainly much more that just attending the four main annual Trustee Board meetings that are held in South West London each year. Not long after I started in 2011, I agreed to run the London Marathon for Missing People. 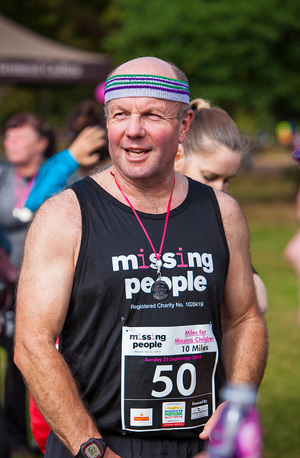 I felt very proud wearing my Missing People vest at the start line, and very relieved when I passed over the finish line, well over 4 hours later! It did have other benefits, apart from the funds raised; the then Chief Executive bought me a beer in the pub afterwards! Apparently as a team supporter he was nearly as exhausted as me with all the cheering on of the charity's runners. Since then the sporting efforts have continued and, despite never completing the cycle challenges, I have competed in most of the Miles for Missing runs, first in Regents Park and then Clapham Common, where last year the traditional 10k mysteriously turned into 10 miles. I’m sure there was a slip of the pen somewhere! For a number of years I held the dubious record of being the fastest trustee over 10k. In my time as a trustee, the organisation has grown considerably and taken on new challenges, all with the aim of providing increased support to those who go missing and their families. This has only been possible with the superb staff at the charity's London head quarters, and indeed now in other parts of the country, who never cease to amaze me with their absolute commitment to the role. They are of course ably assisted by the fantastic volunteers who give so much of their own time. I should include in this of my fellow trustees, some of whom I have worked alongside for many years. Being a trustee does of course bring with it responsibility as well. I have been heavily involved in the recruitment of new trustees, but in particular the appointments of the current Chief Executive Jo Youle, and the current Chair of Trustees, Kate Adams. In any organisation, selecting the right people for key roles is really important. The processes we use for selection involve a personal commitment of a lot of time, but I am pleased to say we certainly ended up with the right people! What else do I do? I also chair the Services Group, which over the years has brought together a range of experts from outside of the charity to help and advise on a variety of operational matters, from the development of new services to the staffing of the helpline. Another group I chair is the Safeguarding Board, which is fairly new. We look at Safeguarding and ensure the charity follows the correct policies and procedures. It’s coming up to the time of year which can be particularly difficult for those missing a loved one. It will be my pleasure to once again be attending the London Carol Service being held at St Martin-in-the-Fields. I look forward to hearing the Missing People Choir who have done so much this year to raise the profile of missing nationally. I hope to see some of you there! There are just over 1 million trustees in the UK, and we're incredibly proud of ours! Find out more about Trustee's Week.